Every now and then something so revolutionary comes along, it turns the vegan world upside down. Vegusto is one of those things. Don’t say I didn’t warn you! During the last few months I have been enjoying a new vegan cheese range known as Vegusto. It isn’t easy to find in the UK but when you do get your hands on it, you won’t soon forget. 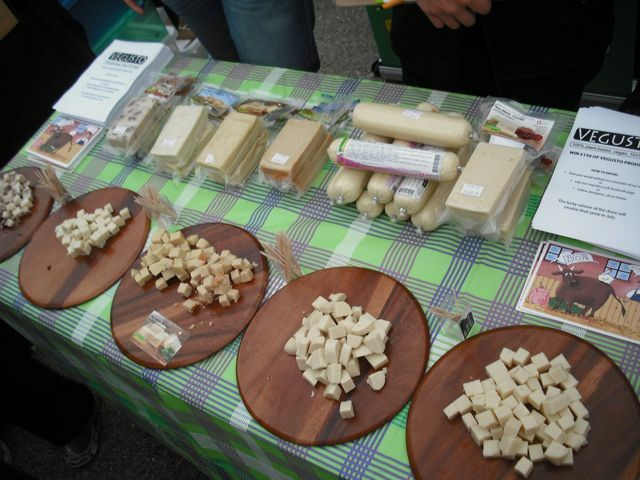 The plant-based cheeses are made in Switzerland and are slowly working their way around Europe. I spoke with representatives at the recent Bristol VegFest who assured me they are toiling away with plans to get the range into health food stores around the UK as soon as possible. So, they are on their way but what are they like? Simply stunning. In my FGV opinion, they are miles above their nearest competitors. The range includes hard cheeses that tower above Redwood and melting cheeses that dwarf Daiya. Oh yes, I went there. 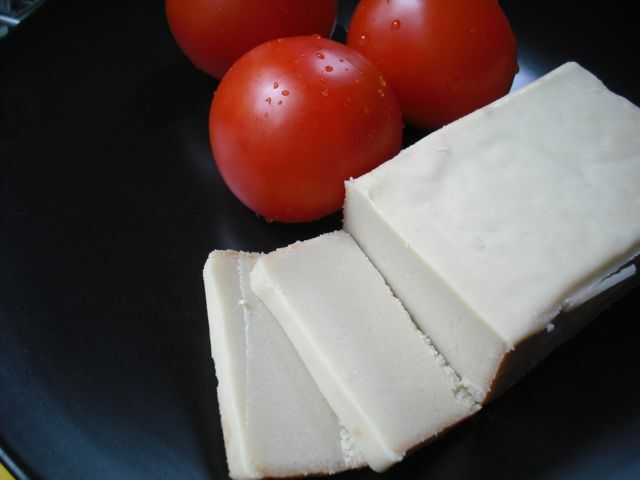 A vegan cheese better than Daiya. Every which way I have eaten Vegusto has blown me away. 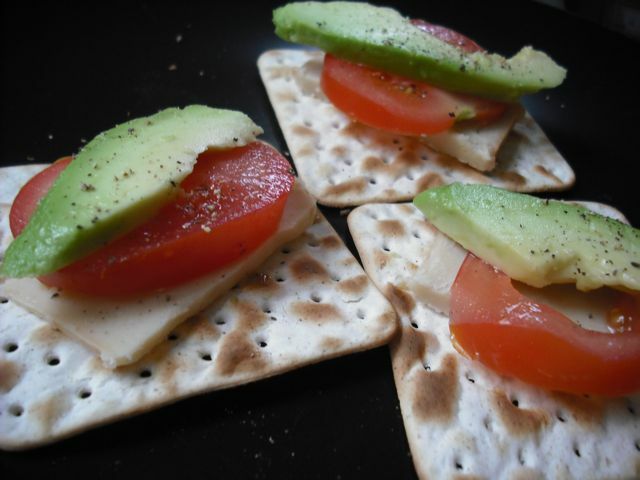 Sliced with fresh tomato and avocado on crackers was fabulous. The range of cheeses on offer by Vegusto is impressive. In addition to the piquant mentioned above the range also features herb, walnut, classic, mildly-aromatic, snack size and melty. 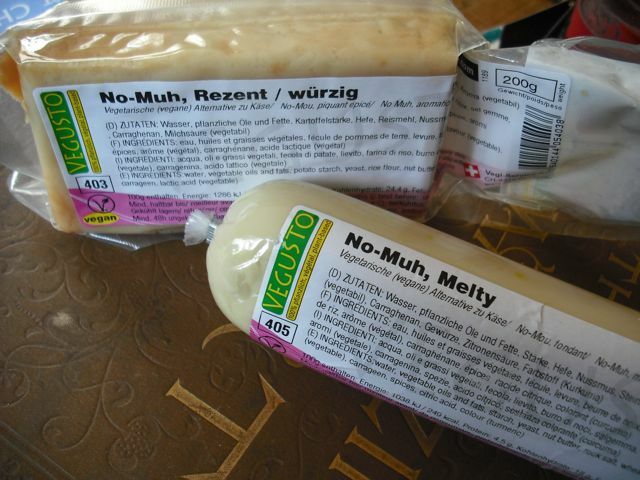 The melty product melts more convincingly and thoroughly than any other vegan cheese I’ve seen anywhere and the taste is incredible. 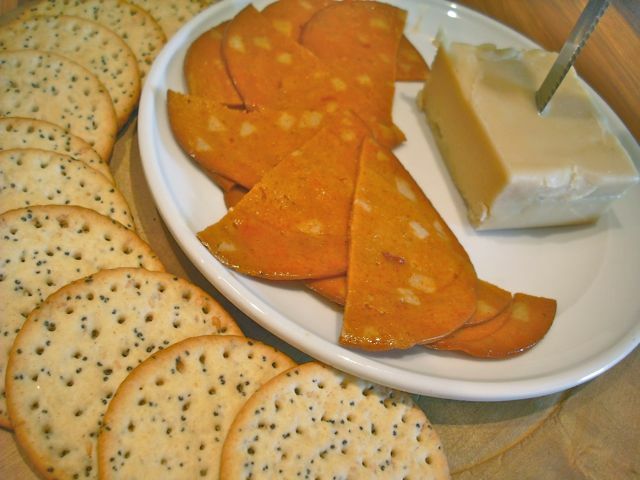 I recently served up a plate of the piquant with crackers and Wheaty salami for afternoon tea. Every one of my guests was overly complimentary of the Vegusto and it lasted mere minutes before it was devoured completely. I should mention my guests were non-vegans who consider themselves dairy cheese connoisseurs. They adored the Vegusto. I was almost sorry I served it as I would have loved more for myself. Does that make me a bad FGV? I truly can’t say enough nice words about Vegusto. It is officially my favourite vegan cheese on the planet. The company also make a staggering range of vegan meats, burgers, cold cuts, meatloaf, sausages, pates, mayonnaise and even pet food for dogs and cats. I haven’t seen any of these around my part of the world but believe me when I say I’m looking. Vx boutique in Kings Cross currently sell a range of their cheeses. If you are in London, you should get along promptly for a few products. You’ll love them. A UK Vegusto website is poised to go live in July and orders will be shipping from a local warehouse. My first order will be a big one. That’s good news they’re trying to get their stuff into more UK shops and that they’re going to ship locally! You’re right- their cheese is the bestest! Ooh great review FGV! I’ve never really gotten into vegan cheese..until that is I had daiya cheese, jalepeno wontons in LA.. A.. ha mazing! But..you’ve gone and scouted an even better one! Bravo! will be grabbing a block next time I’m in Vx. Thanks! A decent vegan cheese? Whoop whoop! I haven’t had much vegan cheese, but what I have had has been pretty disgusting. Thank you so much for your great review. You put a big smile on our faces at Vegusto. All the goodies are produced here at our premises in Switzerland (vegan cheese heaven). All products are handmade with lots of love and care. The whole Vegusto team is highly motivated since we are all vegan ourselves. Soon Vegusto is widely available all over England and Ireland. So just hang in there! God I can’t wait. I’ve just checked out their website it looks amazing. Cheezley and Toffuti cheese are okay but not as good as the real thing. The hubby is a major cheese head he will be excited if we can get some vegan Swiss cheese! Bit confused by the vegan cat food though…I thought cats were obligates, i.e. they have to eat meat to survive. I know dogs do fine as vegans. Homigod I just found out about this new cheese and I can’t wait to try it. Yay! I do love Cheezly actually, but God, we really could do with some more options. I agree Vegusto cheese is amazing. One of the hardest things I found about becoming vegan was giving up cheese. I finally gave it up for good, and 2 seconds later along came vegusto! It truly is great with everything, or even just on its own. I spotted it, and plenty more from the range, at Alara Health Store in Bloomsbury, London. I also recommend the vegan steaks very highly. Ah, Vegusto. Wonderful, wonderful vegan meats and cheeses. When I first tasted items from this range I thought I’d died and gone to culinary heaven, and I still do! They are quite widely available in many local areas now, even my local pharmacist/health food shop has a large array displayed in their fridge. I just wish they were more readily available in supermarkets. Unfortunately my local supermarket (Sainsbury’s) can’t seem to move beyond brands like Quorn (completely non-vegan) and Linda McCartney (mostly non-vegan) in their vegetarian ranges. Vegusto also don’t use palm oil which is a huge plus. I shop in Vx in kings cross quite often and I have never seen vegusto sold there. They do do other fake cheeses I think mostly from Germany but Vegusto is much better IMO. I’m not sure if they have palm oil as the ingrediants on some aren’t in English. Whole foods sell it though, the one in Camden and Piccadily does anyway.